Angus food and drink is on the move. In recent years this fertile patch of farmland, hill and coastline in northeast Scotland has found its voice in celebrating the produce it can call its own, from recipes and production methods handed down through generations to exciting new innovations and dynamic food enterprises. The new third edition of the Angus Larder showcases the pride of the region’s produce and culinary scene, introducing ‘52 Great Foods from Angus’ – representatives of the best local food and drink from Arbroath smokies to potato vodka, Forfar bridies to honeyberries, as well as some inspiring ways to use local produce provided by local chefs, cooks and food champions. 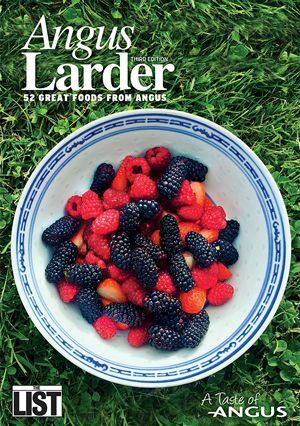 Just as importantly, the Angus Larder helps you to find these riches, with practical listings both in print and online to the shops, markets, festivals, cafés, stalls and restaurants where food and drink from Angus is being served. Published in a fully updated new edition in March 2017, and independently compiled to reflect the best of Angus’s contemporary food scene, this is above all a guide to help you find, appreciate and enjoy great local food. The comprehensive Where to Eat guide includes cafés and pubs, restaurants, bistros and takeaways. Need a good butcher? Where to Buy lists the best independent food and drink shops in Angus. Local chefs tell you about their most trusted local suppliers. Read the stories of the people who create the unique flavours of the region – the farmers, fishermen, fruit growers, curers, bakers and brewers.